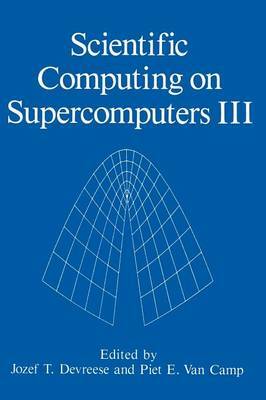 The International Workshop on "The Use of Supercomputers in Theoretical Science" took place on January 24 and 25, 1991, at the University of Antwerp (UIA), Antwerpen, Belgium. It was the sixth in a series of workshops, the fIrst of which took place in 1984. The principal aim of these workshops is to present the state of the art in scientific large-scale and high speed-computation. Computational science has developed into a third methodology equally important now as its theoretical and experimental companions. Gradually academic researchers acquired access to a variety of supercomputers and as a consequence computational science has become a major tool for their work. It is a pleasure to thank the Belgian National Science Foundation (NFWO-FNRS) and the Ministry of ScientifIc Affairs for sponsoring the workshop. It was organized both in the framework of the Third Cycle "Vectorization, Parallel Processing and Supercomputers" and the "Governemental Program in Information Technology". We also very much would like to thank the University of Antwerp (Universitaire Instelling Antwerpen -VIA) for fInancial and material support. Special thanks are due to Mrs. H. Evans for the typing and editing of the manuscripts and for the preparation of the author and subject indexes. J.T. Devreese P.E. Van Camp University of Antwerp July 1991 v CONlENTS High Perfonnance Numerically Intensive Applications on Distributed Memory Parallel Computers .................... . F.W. Wray Abstract ......................................... .